When there's no more room in hell, the dead may walk on MTV. It's rumored that MTV is in talks to create a television series spin-off of George Romero's classic zombie film Dawn of the Dead. Dawn of the Dead could be the most important piece of zombie entertainment to ever grace the Earth, inspiring countless other forms of media. It was successfully remade in 2004 by director Zack Snyder, who later did Watchmen and 300. The development of this series is as rumored as rumors can get, with horror site Bloody Disgusting somehow getting the scoop but later removing the news story for an unknown reason. It can still be found cached here. If it's real, it could be the second zombie television series to look forward to in the near future, along with the more confirmed Walking Dead TV series hopefully on its way to AMC in 2010. 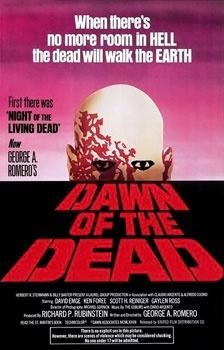 The original Dawn of the Dead featured typical slow-moving zombies, while the remake featured fast ones. As of now, MTV's spin-off could include both types. I'm of the belief that if your body is decaying, the joints and muscles probably wouldn't work well enough to run at top speed for too long. For this reason, slow moving zombies are more realistic. Fast moving zombies are more terrifying though, and a mix could work well, just as long as the fast moving zombie isn't used as an end-of-season cliffhanger. This series could be the first show on MTV worthy of DVR'ing since Paris Hilton's My New BFF. I mean, since My Super Sweet 16. I mean, since... Jackass? It will nicely complement other MTV shows such as Next and that Tila Tequila show. I would assume that a Dawn of the Dead spin-off series, even on MTV, would be made by someone who knows what they're doing, but for now I'm putting more faith in Walking Dead, which is based on a comic series that every zombie fan needs to read.